No… this isn’t a tutorial or an April Fool’s joke. The MRMC Social Club, via GiselleArceneaux, asked that I post about their effort to increase awareness of domestic violence and sexual assault toward a goal of ending it. So, here is their announcement of an upcoming event in Second Life™. NO MORE is a unifying symbol and campaign to raise public awareness and engage bystanders around ending domestic violence and sexual assault. Launched in March 2013 by a coalition of leading advocacy groups, service providers, the U.S. Department of Justice, and major corporations, NO MORE is supported by hundreds of national and local groups and by thousands of individuals, organizations, universities, and communities who are using its signature blue symbol to increase visibility for domestic violence and sexual assault. Further information is available at nomore.org. This is an awareness event, not a fundraiser…. 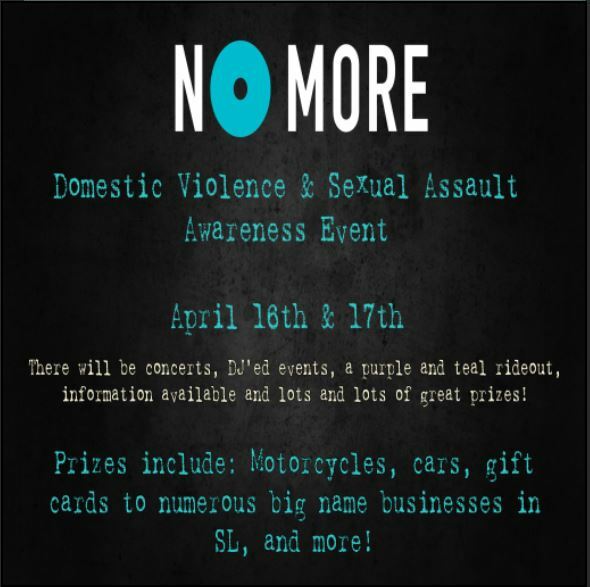 in addition to entertainment and social activities, some featuring prizes, there will be information readily available about domestic violence and sexual assault, including stats, warning signs, and information as to where to go and who to contact for help. Concerts and DJ’d events. There will also be free gifts as well as prizes given during dj’ ed events. In addition to this there will also be a “Purple and Teal” ride out on Sunday the 17th starting at 2pm on the Sturgis sim. 2 pm slt DJ’ed event with DJ Niki Blingtastic- Don’t ever dull your sparkle event Prizes will be giftcards from Chop Zuey., Earthstones & more! 4 pm SLT DJ’ ed event with DJ Phil, On Point- Look good, Feel good, Do good event. Prizes will be gift cards from- Truth, Blueberry, Zed, R3volt!, Breakthrough and Shovelheads. 6 pm SLT DJ’ ed event with DJ TBD. Puppies, Kitties, & Mossms oh my!- Breedables event. Prizes will include breedable pets such as dogs, cats, Mossms, and possibly more! 2 pm SLT Purple and Teal Ride out on the Sturgis Sim- will be a Dj as well this ride out is to raise awareness and to honor victims and Survivors of domestic violence and sexual assault. Riders are encouraged to wear purple and/ or teal. 4 pm SLT Dj ‘ ed event Dj Phil, There’s no place like home!- happy home, happy life event. Prizes include gift cards from Trompe Loeil, Mud Honey, Floorplan and more! 6 pm SLT Dj’ ed event- DJ Wade. Live it, Love it, Ride it, Drive it !- motorcycle and car event. Prizes include motorcycles and cars from Sinful Motors, Sucios Custom Creations, and Roaddogg;s Custom Car’s. There will also be a gift card from Sau. This entry was posted in General News, Second Life and tagged Events. Bookmark the permalink. ← Second Life: Forced Firestorm Experience? I’m sure the musical group is great but the name –for a domestic violence awareness event? Hopefully not created for this event !